The events currently unfolding in the Middle East could lead to a major redrawing of the boundaries in the region, with the emergence of a new state, Kurdistan, in the Kurdish-populated areas of Iraq, Syria and Turkey. Some international experts already speak openly about such a possibility. And such a prospect will have a bearing on Armenia as well, since potentially it may get a new neighbor. Iraqi Kurdistan is de facto independent, Syria’s Kurdish-populated areas are also close to achieving independence from Damascus, and their reunion is no longer deemed as a fancy scenario. At present, the Turkish government is doing everything to prevent the Turkish Kurds from joining the growing national-liberation movement of Kurds in the Middle East. The Kurdistan Workers’ Party, better known as PKK, has long been fighting for autonomy in Turkey, and for 40 years Ankara has waged an uncompromising struggle against Kurdish separatism. Sensing the danger recently, however, Turkish Prime Minister Recep Tayyip Erdogan has decided to resume talks with the PKK leader, Abdullah Ocalan, who is now serving a life sentence in a Turkish jail. According to Turkish media, Ocalan allegedly assured Ankara that his party was fighting not for independence and establishment of Kurdistan, but only for autonomy within Turkey. Apparently, Turkey can grant autonomy to its Kurds and facilitate the creation of Kurdistan on the territories of Syria and Iraq. Some reports indicate that Erdogan contemplates a visit to Washington next month for the lobbying of this issue. However, the killing of three Kurdish female activists in Paris, France, a few days ago was, apparently, aimed at disrupting the Turkish-Kurdish reconciliation plan. More and more experts now are inclined to believe that eventually Turkey will be divided. 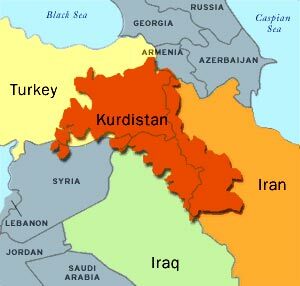 It is not completely clear now on what areas a possible Kurdish autonomy in Turkey could be established – if it could at all – or what lands an emerging independent Kurdistan could claim from Turkey, but some Armenian experts already now fear that the plans may also affect the territories of historical Armenia that are now under Turkish control. Technically, Kurdish lands are situated south of so-called Western Armenia, but the issue of historical Armenian lands in Turkey will not be avoided in the event of a major revision of borders in the region. Officials in Ankara acknowledge that Turkey is in for hard times in view of the approaching year 2015 – the centennial of the Ottoman-era Armenian Genocide that successive Turkish governments have refused to admit. The possible recognition of the Armenian Genocide on its 100th anniversary by the United States will inevitably lead to territorial claims to Turkey from Armenia. Turkey clearly understands this and the tide of what look like ethnically motivated attacks against Armenians in Turkey in recent days is more proof to this point. Three ethnic Armenians have fallen victim to apparent racist attacks in Istanbul lately. An elderly woman and a man who taught at a local Armenian school have been brutally murdered, with their throats cut, while another woman escaped with a severe injury after a taxi driver attacked her only because she spoke Armenian. This is likely to lead to an exacerbation in Armenian-Turkish relations as well. Official Yerevan has not made any statement in this regard yet, but Armenia is seeing large-scale preparations for the 100th anniversary of the Armenian Genocide, which in itself is a strong message and challenge to the more powerful neighbor. Director of the Yerevan-based Modus Vivendi think tank, former Ambassador to Canada Ara Papian thinks that Armenia needs to be developing its relations with Kurds. This alliance, he says, is needed in any case – no matter if the Kurds manage to dismember Turkey, if they achieve autonomy in Turkish territory or will just continue fighting for independence as they are now. Yerevan has never made any formal territorial claims to Turkey, but Armenia still does not recognize the current borders of the Turkish Republic formed under the 1921 Treaty of Moscow. This is also enshrined in the Constitution of the Republic of Armenia. Meanwhile, voices in support of another international document, the Treaty of Sevres that was signed between the Ottoman Empire and the Allies at the end of World War I, are getting louder within the public and political circles of Armenia. Turkey subsequently refused to ratify the treaty that implied the establishment of so-called Wilsonian Armenia, the boundary configuration of the Armenian state drawn by the then U.S. President Woodrow Wilson to incorporate some of the formerly Armenian-populated areas of the Ottoman Empire and provide democratic Armenia with an outlet to the Black Sea.